Blessing of the wine and bread. St. David’s is a diverse and vibrant congregation of about four hundred people who are seeking to grow in the knowledge and love of God. You will find a varied and healthy mixture of people at St. David’s, some of whom are cradle-to-grave Episcopalians and others who have come from other denominations and faith traditions. This diversity is good. We bear out in our everyday lives and worship the truth of St. Paul’s words, “there are different kinds of services, but the same Lord.” You will find that you do not have to have all the answers to be a member of St. David’s. “Searching” is an important part of the faith experience. We feel that with the guidance of the Holy Spirit and by reaching out to each other, we all will find the answers in the One who is “the Way, the Truth, and the Life”. In short, we see ourselves as being on a journey of faith and we invite you to join us in this journey. We hope you find this website helpful. If there is anything we can do to help you in any way, please contact us. Teddy bears for children in need. 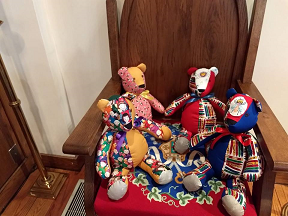 St. David's Daughters of the King created these teddy bears as part of their ministry.. They go to the Richland County Sheriff's department to give to children who are in need. What is the Kairos Prison Ministry? The Kairos Prison Ministry is about going and sharing the word of God and Christ to those who are incarcerated and want to know more about the love of Christ. Our church has been involved in the ministry for many years. We take food and care to those who cannot come to us. We are looking for donations of cookies. Cookies can be baked or store bought. If you wish to donate, please place them in a clear plastic bag. The next prison visit will be April 24 through April 28. Please call the church office (803) 736-0866 and ask to contact Joe Smoak. You can vist the Kairos Prison Ministry website here. 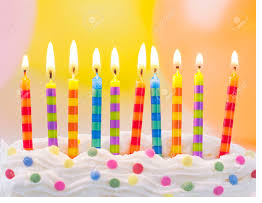 St Davids is turning 30! That's right. St Davids is turning 30 this year in March. St. David's was formed, with the assistance of St. Martin's-in-the Fields Episcopal Church. Fifteen families from St. Martin's agreed to establish the new community. St. David, the patronsaid of Wales, is celebrted on march 1, the date of St. David's death in 589 A.D. On Sunday, March 3, we celebrate St. David's Day and the thirtieth anniversary of being in our present church home. Join us for a Pancake Brunch following the 10:30 a.m. worship service.